The delicate translucency seen on this colored glass is achieved through the use of specialty glazing. What is Translucent Colored Glass? The beautiful luminescent color is achieved by fusing colored glazes onto the back surface of each pure piece of glass, reaching temperatures above 1600 degrees Fahrenheit during the production process. You are actually looking through the glass and viewing the rich color fused onto the back. Durability: Translucent glass is strong and durable. It is impervious to water or stains, is frost-proof, can handle extremes of heating and cooling without showing signs of cracking or stressing, and is resistant to chemical attack, fading and discoloration. Range of Glass Colors: A stunning variety of colors can be achieved with this process. 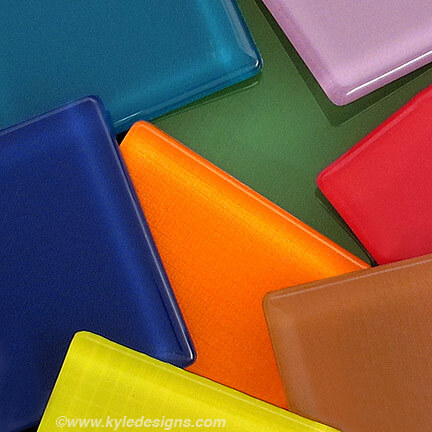 Kyle Design uses the following colors in our unique gift items: Black, White, Caramel, Cobalt, Blue, Rose, Pink, Plum, Lavender, Purple, Red, Orange, Poppy, Yellow, Lime, Mint, Aqua, Verdigris, Teal and Green. Artist Kyle McKeown Mansfield uses this rich, beautiful translucent glass in her very special wooden memory boxes and message magnets. To see more of the distinctive interplay of intense color and crisp etched metal designs, click Unique Memory Boxes Inlaid with Glass & Iridescent Colored Film and Colorful Clip Magnets.